PHOTOS: Above – Bushfire this week near the sewerage plant and the dump, within the municipal area. 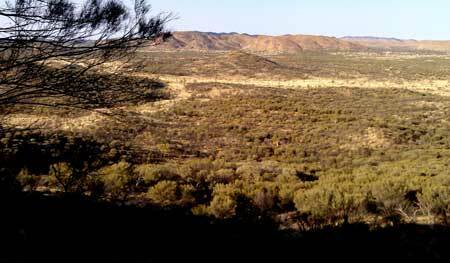 Below – West MacDonnells country near Simpson’s Gap: between the bushes, an ocean of buffel grass, little evidence of precautionary burning. The trouble with controlling bushfires is the massive amount of information we do not have, says renowned Central Australian botanist, Peter Latz. And even the sparse knowledge we do have can’t be put to much use because we don’t have the men and machines. A spokesperson for the Parks and Wildlife Commission says the extensive fires in 2011-12 and minimal summer rain in 2013-14 mean fuel loads remain low. That augurs well for the imminent bushfire season – but it can all change in a flash. The commission would only give a general statement about its hazard reduction this winter, including in Simpson’s Gap which, it says, “has been impacted by large fires in both the 2001-02 and 2011-12 fire events, covering about 80% in both fire events”. Simpson’s Gap is the Western MacDonnells’ beauty spot closest to Alice Springs. Mr Latz says unlike the south-east of the nation, or the Top End, where climatic conditions affecting wildfires are “nice and predictable,” in The Centre rainstorms can make a big difference, boosting the vegetation growth which then can dry off in a matter of weeks. “Australia is much bigger than people imagine,” says Mr Latz (at left). He says he took part in a survey of Newhaven Station, identifying animal and plant communities sensitive to fire. But Newhaven, north-west of Alice Springs, is a “pin prick” in the vastness of the Australian continent. He says in the nation’s densely settled area, the loss of 100 houses is seen as a tragedy. Satellite technology is increasing the knowledge of what needs to be done. But there is nowhere near the staff nor the equipment to be doing it. Protection efforts are – necessarily – limited to assets such as station homesteads or rangers’ officers and accommodation. “And we still don’t know what to do with buffel” which, with each wildfire, takes over more ground from native vegetation, usually the most fertile land. Edwin Edlund, spokesperson for the Parks and Wildlife Commission, says: “Fuel load assessments are conducted each year across the region at the end of summer and then burn locations and requirements are planned accordingly. “The extensive fires in 2011-12 and minimal summer rain in 2013-14 mean fuel loads remain low. “The main areas of cool burning conducted this year have been in the West MacDonnell National Park (including Simpson’s Gap), Owen Springs Reserve and Finke Gorge National Park. “Other hazard reduction such as slashing and grading of fire breaks has been undertaken. “Simpson’s Gap makes up 325 km² (~ 12%) of West MacDonnell National Park, which is 2586 km² in total. I wonder what Peter (and others) think of Bill Gammage’s work ‘The BIGGEST ESTATE on EARTH – How Aborigines made Australia’? Gammage seeks to make the case that the fire risks around the country now are a consequence of Aboriginal sequential seasonal burning ending with European occupation, and timidity on the part of conservation agencies. Hi Erwin, would love to hear more about Latzy’s work at Newhaven, a special place. I really enjoyed camping there, great facilities, and the website field trip notes are very informative. Several great self drive tours to enjoy. A paradise for nature lovers.